Mozilla Introduced The Firefox Application Store for Android: Mozilla has just released the latest version of its Firefox browser for Android Aurora which has included for the first time Firefox application market, similar to the Chrome Web Store. 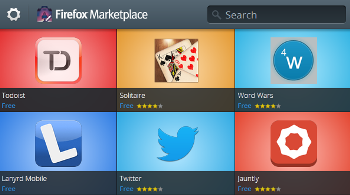 Through the ‘market’ of the first Firefox users can browse the store to find applications and web developers can take advantage of the space of Mozilla as a platform to showcase their web applications. The apps run in full screen mode and can also be attached to the home screen. The market divides its contents into nine distinct categories: Books & Reference, business, education, entertainment, gaming and health, among others. As explained in the official blog of Mozilla Firefox for Android Marketplace is intended to be an open ecosystem where developers are those who control the content, functionality and distribution applications. To facilitate this open ecosystem, Firefox offers developers a number of APIs for filing, paying and discover applications. After this initial test launch, the market will find its way through Firefox Aurora and Beta versions. In addition, the Marketplace Firefox will become a piece sticks for OS Firefox for mobile devices.